Blue Pottery came to Jaipur from the land of Mughals (Persia). Mughals brought it to India through Kashmir and with time it spread out, currently, Blue Pottery lodge its feet in Jaipur, Rajasthan & is now well known as Jaipur Blue Pottery. The main reason for the establishment of this Art in Jaipur is the fondness of Jaipur Royals towards the blue pottery Art. Blue pottery flourishes in Jaipur in the regime of Maharaja Sawai Jai Singh. Presence of Blue pottery can be seen in the famous palaces and museum of the city. 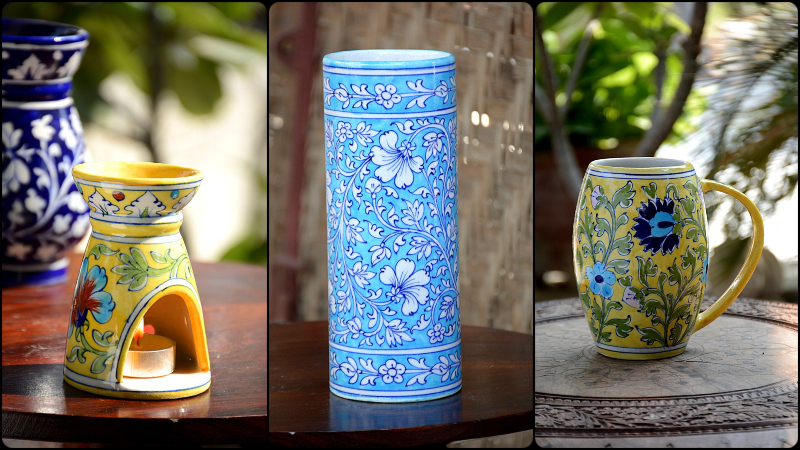 Blue Pottery took an interesting route in finding its home in Jaipur. His Highness Maharaja Sawai Ram Singh II once attended a kite flying session and watched two brothers from Achnera bring down the royal kites of his kite masters. Intrigued, he found the secret; they were potters by profession and had coated their strings with the same blue-green glass that they used for their pots. Sawai Ram Singh II was impressed so he invited the brothers to stay in Jaipur and teach this unique form of glazed pottery at his new art school. 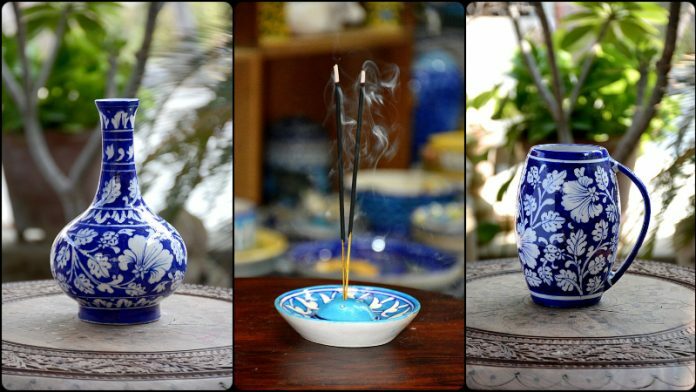 The term ‘Blue Pottery’ comes from the brilliantly bright & eye-catching Persian blue dye used to dye the ceramic. Blue Pottery had enormous potential and should have flourished, but over the years master potters refused to share their trade secrets with their fellow craftsmen so there was an eventual lowering of standards and a gradual dying out of the craft. The new generation is not interested in learning the art. The manufacturing process of Blue pottery is also very complex due to which production and demands are very unequal. By the year 1950, the art was completely washed away and was reintroduced by the efforts of muralists and painter Kripal Singh Shekhawat with the help and support of craft revivalist Kamaladevi Chattopadhyay and Her Highness Maharani Gayatri Devi thus began the Renaissance. It is the only pottery in the world which does not use clay in its ingredients. Blue pottery products are made out of an Egyptian paste which is composed of powdered glass, quartz stone powder, borax, Multani mitti (fuller’s earth) and water. The making starts with the molding of dough as per the desired requirements. When the dough acquires the needed shape as of molds it is left to dry for one or two days. After the finishing is done with brass stone, sandpaper, and water. Then come to the designing process where various kinds of animal or flower motifs are drawn. The solution which is used for designing is a mixture of copper oxide and gum and thus it gains its blue color because of copper oxide. Once the paint is dried glazing is done. Paint glaze is achieved by mixing powdered glass, zinc oxide, borax, potassium nitrate, boric acid in maida(flour) and water. At last, they are fired at a low temperature in a brick kiln for 4 hours and are then kept for cooling for the following few days. We caught up with Ankit Sharma to hear more about his brand and try to know his approach towards Blue Pottery. 1. When was the BLUE DÉCOR brand was established? 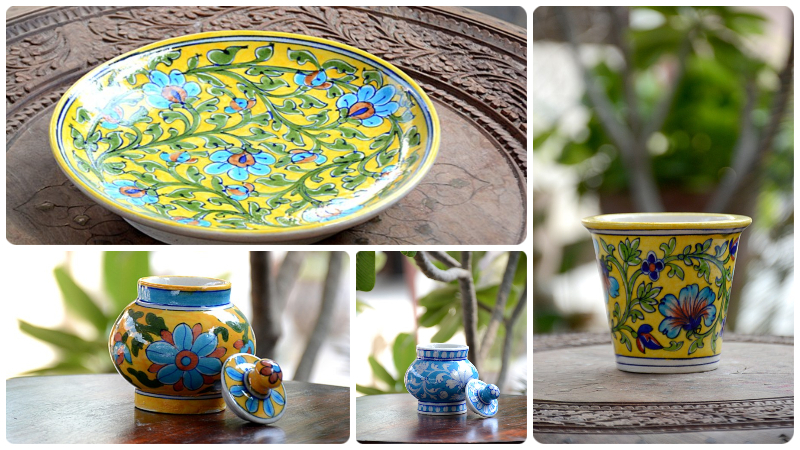 The brand was established in the year 2014 and the major reason behind the establishment was to promote ‘Blue Pottery’ not only as a product but also as the desired object which everybody wants to have it. 2. How many artisans are involved with the brand? There are 7 artisans, 3 women, and 4 men. 3. Traditionally the women of the house had a role like grinding and the men used to undertake the throwing and molding part as their in making of the product. Do they still follow it? No, women, these days are more independent and are not bound to do one job. So it’s not like that the duties are distributed rather the process of making the product is equally been done by both of them. 4. How your brand is helping the artisans and what kind of relief you provide? We basically choose our artisans from the remote Kumhar (potter) villages so that they can know what kind of products are been made these days and how design intervention can help in improving their skills. We provide relief in work i.e. the person can work from home and gets equal pay without marking them absent. 5. Is there any specific season when the production is carried out efficiently and in which season the sale is more? The summers are best for developing the products and most of the production is carried out in this season because it takes 4 weeks to complete one product and the next season would be Monsoon and that’s the season in which we have to stop the production completely. The most favorable time is the festive season and the New Year’s for selling out our products. 6. How will you explain how your brand is different from other existing brands? Our brand has a collection of designs which very unique as compared to other brands and we are the one who introduced the dispensers in Bathroom Accessories and those are the most sellable object in comparison to our other products. So, have your beer while watching football world cup like a royalty with blue pottery beer mug… visit www.bluedecor.in Sign up now and get INR 200 in your wallet and get 10% discount on your orders. Avid Reader, Compulsive writer, Brooding Idealist!